The paper addresses the relationship between design and the digital humanities, asking what each can learn from the other and how they may make progress together. The focus is critical making in chronographics — the time-wise visualisation of history — based on the authors’ historic research and current practice in visualising collections of cultural objects and events. This is situated in historic and contemporary contexts, arguing that the eighteenth century origins of the modern timeline have useful insights to offer in terms of objectives and rationale. The authors advocate a critical approach to visualisation that requires both design and digital humanities to face up to the problems of uncertainty, imprecision, and curatorial process, including in relation to time itself. Boyd Davis, S. and Kräutli, F., 2015. 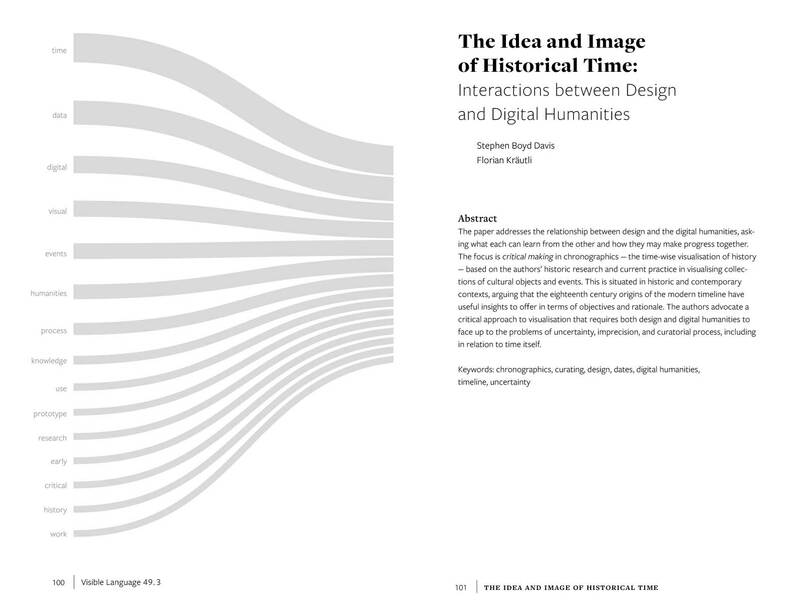 The Idea and Image of Historical Time: Interactions between Design and Digital Humanities. Visible Language, 49(3), pp.101–119. Available at: http://visiblelanguagejournal.com/issue/172/article/1202.